Starting or Growing your small Food or Drink producing business. 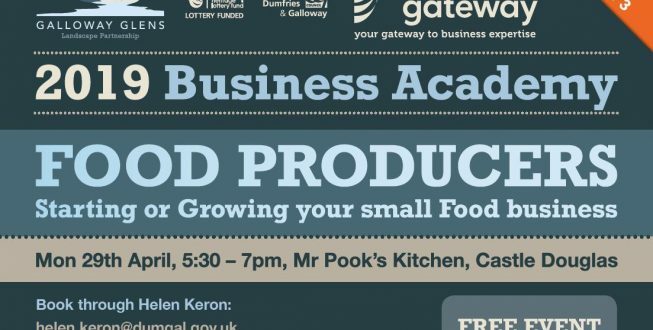 After the success of our first 2 events, we are hosting our third Business Academy event in Mr Pook’s Kitchen, Castle Douglas on Monday 29th April from 5:30 – 7pm. People attending the first two events have commented on the detailed relevant information they received that will help them grow their business. * Regulatory compliance for starting a food business. * Making the step up to selling at retail outlets. * Setting margins and planning for financial success. It’s a free event thanks to our Heritage Lottery and Business Gateway partners, but do book your place at helen.keron@dumgal.gov.uk if you’d like to come along.